This puts the sucking in I’m Gonna Git You Sucka? 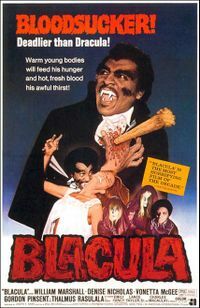 Anyway, here’s a terrific African American vampire movie…a portmanteau of black and Dracula (obviously). And that movie is: Blacula. The flick stars the imposing, booming-voiced actor, William Marshall (a Bard-trained theater guy brings great gravitas to the role of The Count. . He plays an 18th-century African prince named Mamuwalde, who is turned into a vampire (and later locked in a coffin) by Count Dracula in the Count’s castle in Transylvania in the year 1780 after Dracula refuses to help Mamuwalde suppress the North African / European slave trade. Two centuries later, in the year 1972, two very effete interior decorators from modern-day La La Land, travel to Eastern Europe and unknowingly purchase a rare piece of furniture – Blacula’s coffin. They have it shipped to Los Angeles…and you guessed it… All hell breaks loose. 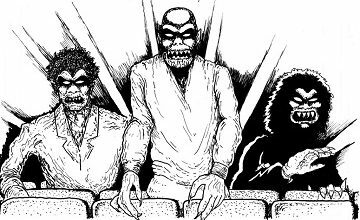 Blacula was followed by the sequel Scream Blacula Scream in 1973 and inspired a wave of blaxploitation-themed horror films.